Memphis 61: Paper Dress 11th Birthday! 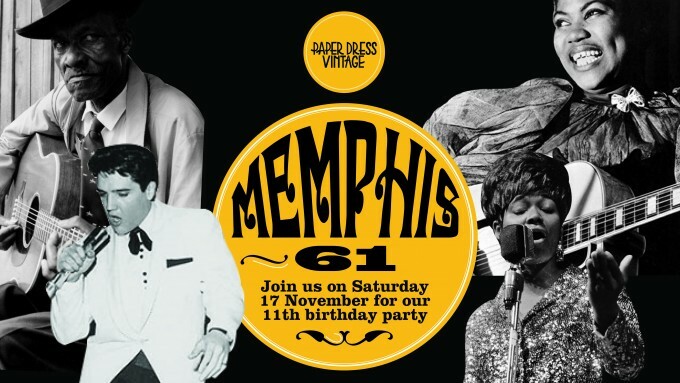 Take a trip with us to Memphis, Tennessee, 1961 as we celebrate Paper Dress Vintage’s 11th birthday by getting down to influential strains of blues, soul & rock ‘n’ roll that originated there..
Stax Records, Elvis Presley, B.B. King., Johnny Cash, Booker T & The MGs, Alberta Hunter, Sun Studios, Robert Johnson, the Staple Singers, Jerry Lee Lewis, Otis Redding, Sam and Dave the list goes on and on and on. We have 4 very special guest live acts performing on the night in the shape of Soul dons Soul Grenades, Robert Ray will be pulling together a lineup of top notch musicians for Robert Ray’s Memphis Revue, Felix Holt and The Radicals will capture the spirit of country & RnR and Iago Banet opens up with a set of country blues. Between and after the bands there’ll be vinyl-only DJ sets from Worth Wagers & Perri Kaye till the early hours. Advance tickets just £8 – more on the door! 9 piece Funk & Soul band! Ray’s Presley-esque vocal will guide you through the back catalogue of Sun Studios, including hits from Johnny Cash, Roy Orbison and Carl Perkins and expect some raunchy R’n’B classics from the likes of Rosco Gordon, Rufus Thomas and Memphis Slim.